Gardening, wrapping presents, dyeing Easter eggs, baking cookies, stringing Holiday lights, folding towels. What do these things have in common? If you guessed that these tasks can all be utilized in an occupational therapy session, give yourself a pat on the back! Put down the boring weights and take a break from the therapy gym equipment. Occupational therapists are working with patients in methods that are as unique as one’s occupations, and seniors are benefiting. If you or a loved one are considering occupational therapy, you mistakenly thought an occupational therapist could help you find a new job or you’re interested in learning more for possible future needs, then continue reading. If occupational therapy doesn’t have to do with your career and it’s not the same as physical therapy, then what exactly is it? We are glad you asked. Occupational therapy (OT) helps people of all ages participate in the things they need and want to do through therapeutic use of daily activities, also called “occupations.” Take a moment and think of 10 occupations that you need to do throughout the day (hint: eating). Now, have some fun and think of three things that you love to do every day (hint: walking your dog). Imagine that a life event, such as a sudden stroke or surgery, left you unable to perform these occupations. For the older adult, being dependent on a caregiver and isolated from hobbies that bring joy and independence might cause frustration, depression and loneliness, but that’s where an occupational therapist can help. Home Evaluation: An OT can evaluate your loved one in his or her home to determine abilities, skills and safety to provide specific recommendations. The OT can also examine how the person functions in completing tasks such as driving, shopping, going on social outings, getting to doctor’s appointments, and more. Introduce Modifications: An OT can recommend services such as transportation, meal delivery, lawn care or cleaning services to limit the energy spent on those tasks and increase safety in the home. Occupational therapists can take the burden of the uncomfortable conversation you may be avoiding with your loved one, and deliver these recommendations from a place of professional experience and compassion. Slight adjustments, such as upgrading light-bulb wattage for improved visibility, moving hard-to-reach objects to a lower level, placing lights on dark stairways, and adjusting the steering wheel and seat position in a vehicle can have a great impact. Home Optimizations: Minor environment alterations can make a major difference in staying safe at home or in Independent Living or Assisted Living communities. OTs are skilled in detecting how the environment affects their patients’ ability to perform occupations, and they may suggest adding adaptive equipment such as grab bars, stair lifts, lowering counter heights, replacing doorknobs with lever handles, adding railings and widening doorways (many Assisted Living Communities already have this equipment installed). Once modifications are made, OTs will work to help patients use them properly and safely. Prevent Wandering: OTs can provide mental stimulation during the times when wandering is the highest possibility. Prevent Injury: OTs determine when clutter, throw rugs, furniture and other items need to be moved to create a safe space for their patient to enjoy activities. Maintain Safety: OTs will work with your loved one and caregivers to implement a safety plan personalized to the patient. This may include removing dangerous appliances from the kitchen and creating a plan for how your loved one will safely access meals when no one is in the kitchen to help. One in four Americans aged 65 years and older falls each year, and every 19 minutes a senior citizen dies from a fall. With falls being the leading cause of fatal injury in older Americans, it’s clear why occupational therapists focus on fall prevention with older patients. You may have even experienced your loved one withdrawing from favorite activities out of a fear of falling. This is where occupational therapists apply those very activities into therapy. Certified occupational therapy assistant, ShaQuille Lashley with Addington Place at College Harbor Senior Living explains how he enjoys incorporating everyday hobbies into his therapy sessions. He demonstrated that by helping his patient, Mary, bake cookies, he was not only helping her regain strength, but getting her back to engaging in her hobbies! Following a recipe helps improve cognitive skills, an important component of brain health. During this baking (AKA therapy) session, Mary learned to slide items, such as a carton of eggs, along the kitchen counter top rather than lift and carry them to the sink which may cause imbalance, creating a fall risk. Next, they moved to a “need” based task, folding laundry. This task increased Mary’s physical conditioning, worked on sequencing, fine motor skills, and bilateral integration (incorporating both arms into an activity). ShaQuille recommended conserving energy by practicing these occupations in the morning and doing them while seated. He also demonstrated using a reacher to safely pick up items without bending. 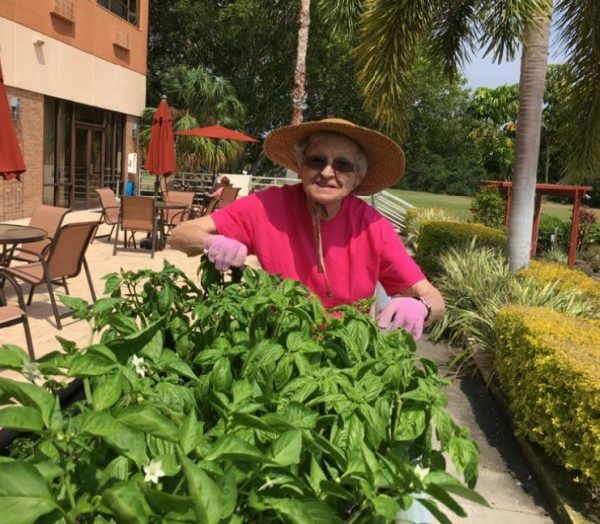 If you were to visit Oak Manor Senior Living & Wrights Healthcare & Rehabilitation Center you would find the occupational therapists working with residents on seasonal crafts that are also therapeutic. For example, during Easter, the OTs assisted residents in dyeing and decorating eggs from start to finish. People who have experienced a stroke may need help with daily occupations since it can affect vision, balance, memory, speech and cognition, and may leave one paralyzed on one side of the body. Approximately three-quarters of strokes occur in people aged 65 and older. Lauren Stewart, OT at Buffalo Crossings Healthcare & Rehabilitation Center in The Villages, says that when working with a stroke patient, she begins by discussing the patient’s goals and asking what is most important to him or her. Whether it’s knitting, cooking or playing with grandchildren, she addresses the physical, cognitive and emotional challenges before starting therapy. Teaching one-handed techniques to get dressed, opening packages and performing other daily chores. Providing adaptive equipment to help maximize ability to perform activities of daily living (bathing, dressing, toileting, etc). Evaluating readiness to drive and referring the patient to a driving specialist. Integrating daily activities into therapy and focusing on areas of concern. Recommending adaptations to return to daily activities and hobbies. Assessing and treating swallowing difficulties. Occupational therapy is offered in hospitals, rehabilitation centers, through home health agencies, and through private practices. To learn more about occupational therapists and how their services might help you or a loved one, check with your physician, health insurance provider, or speak with an assisted living facility or rehabilitation center administrator. When touring assisted living communities, ask if there is a Skilled Nursing & Rehabilitation Center on campus, or if they have a partnership with one nearby. This may provide peace of mind if your loved one needs a higher level of care in the future.